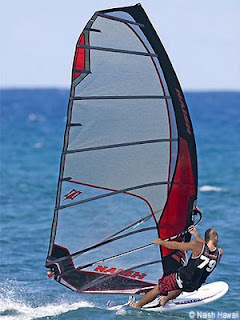 It looks like the new Naish Stealths are complete different from last couple of years. At first sight I see a tighter leech. Looks like a Gaastra Vapor design! I don't know the rider on the pictures, if you reconize the rider maybe we could get some real valuable information. Off course it is new sail, I hope for this surfer that the sail isn't rigged very well. Check his harnasslines and handposition, but also his bodyweight is completly forwarded. I see you haven't really sailed the Stealths to know their characteristics at all. 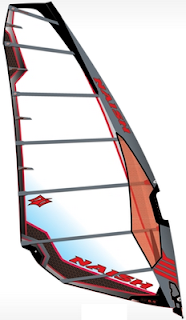 The 2008 had little if any vertical lift and the 2009 is very similar with the main change the addition of lightweight scrim in the upper section of the sail. On the beach the leech is loose down to the 3rd batten when rigged correctly but loaded up on the water it has an even progressive twist profile along the leech. Thank you for this usefull comment! I still haven't seen the new stealth 2009 in the Netherlands. What you're describing sounds very good! I do have a few questions if you don't mind. Have you sailed it yet? And does the sail feel as soft as the older ones? Or is it due the new sailcloth a bit stiffer? The '09 Stealth feels just like the latest generation '08 sails, draft is still locked down low and the leach loads up progressively. They are also very tuneable by changing the top section of the RDM mast to move the power lower and get the sail to twist off more.